“Janet And Michael” conforms to its title, as this sixth episode (or Chapter 20 of the series, as the title card marks it) follows up on the impending crisis that Janet told Michael about last week. This not-so-Good Place is only held together by Janet’s limitless reality-shaping powers, and it’s crumbling. Well, not so much crumbling as suffering spasms of absurdity, whether in the form of floating, disembodied thumbs, mouth frogs, or the rumbling of an earthquake. And, tonight, a shower of projectile coin-vomit and an expertly timed falling 6-foot party sub. The episode looks prepared to pick up right where it left off, as we see an impassive Janet staring blankly into one of those formless voids she’s told us she resides in. That it’s a fake-out back to Michael and Janet’s first meeting (you know, the one where he stole her from the “neutral pocket dimension beneath a shapeless time void” where blank Janets are stored) signals that “Janet And Michael” is going to find the solution to Janet’s perilous glitching in the relationship of these two decidedly inhuman beings. And it does, as the pair eventually comes to the conclusion we’ve already reached that Janet has not only learned to lie, but that her residual memories of her time as Mrs. Jason Mendoza also amplify the hiccups in her control. That this is one of the few times we’ve been a step ahead of The Good Place’s characters isn’t that much of a worry—the narrative and comedic bar set by this show is so deliriously high that taking a little longer to make a leap doesn’t devalue either character in our eyes. For one thing, they’re not human, and all this messy, stupid human ambiguity is hard enough to handle even with a lifetime of stupid human practice. 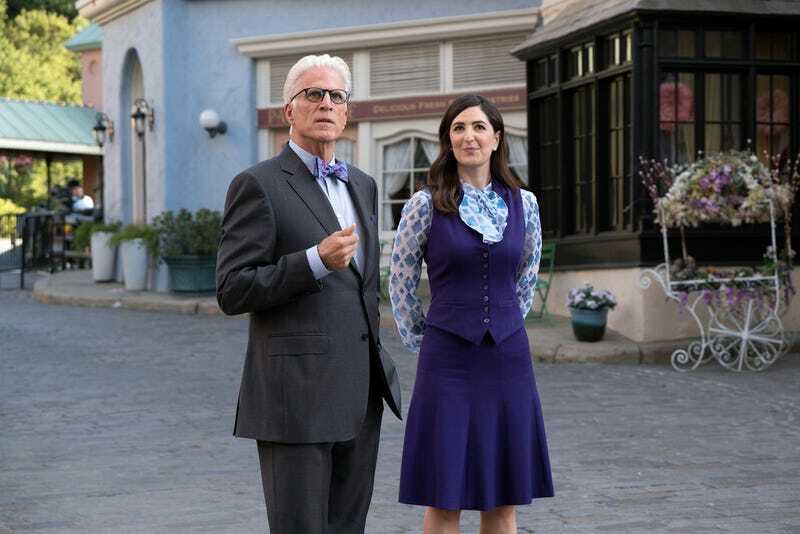 If there’s a concern to be rooted out of this undeniably hilarious and affecting episode, it’s that Michael’s realization that he truly cares for Janet (and therefore can’t permanently kill her by turning her into an inert marble floating through space) hints that The Good Place is in danger of getting too nice. This is almost completely Ted Danson and D’Arcy Carden’s episode, a swerve expertly lampshaded by how well the script (by Kate Gersten) deploys the four other main characters for huge laughs, and then cuts them loose. When Jason and Tahani come looking for Janet to make them a plate of Jason’s beloved jalapeño poppers, or when Michael calls on Eleanor (“our most problematic human”) to advise Janet on her world-imperiling jealousy, or—best of all—when Chidi shows up bristling like a desperately calm porcupine from Vicky’s unimaginative acupuncture needle torture, the briefness of their appearances is a huge part of the joke. (Seriously, William Jackson Harper attempting to maintain his wonted politeness while hundreds of needles vibrate at his underplayed “Don’t mean to be a nudge…” is simply stunning.) The Good Place has used its flashbacks to illustrate what brought people to this not-at-all-Good Place, but Michael and Janet’s story is a whole lot more alien and complicated, what with one immortal duping another into creating an entire evil torture world and all. That “Janet And Michael”’s journey comes down to Michael realizing that Janet is his “oldest, truest, most loyal friend” is, in Danson’s and Carden’s enduringly tricky performances, deeply, strangely sweet. If it teeters right on the edge of too-sweet without toppling over, it’s a testament to the actors and Gersten’s handle on the characters’ essential weirdness. But it does teeter there. Still, the backstory of how this unlikeliest of teams got together is pure comedy, with Carden and Danson building on their cross-purposes chemistry the more we see them together. Michael’s inwardly sweaty desperation as he attempts to realize his crazy demonic dream of a new and better hellscape continues to bat our sympathies back and forth. Dreamers are heroes, or so we’re conditioned to think, and Danson makes his eternally put-upon Bad Place functionary a twisted version of every beleaguered, frustrated artistic visionary we’ve ever seen on screen. It helps that he has Marc Evan Jackson’s peerlessly arch and dismissive Shawn as a boss. When Michael demonstrates in flashback why a Bad Place Janet (Carden, of course, having even more fun, if possible) would be useless in the phony Good Place, Jackson raises his eyebrow just enough to punctuate Bad Janet’s head-melting niceness meltdown with a huge laugh. And, naturally, with Danson driving—and the memory of his indelibly endearing season one Michael still smarting in his loss—Michael is intensely sympathetic, demon or no. Carden’s Janet is an even harder role to calibrate, both in performance and in our responses. Not that Janet’s ever anything but delightful—the joke that she is programmed to deliver even the most unpleasant facts in an unstintingly chipper tone is never not funny. (Here, she makes a point of swapping in a more dramatic line reading after her bright-eyed “You have to kill me, Michael” doesn’t get the job done.) As she and Michael ferret out the idea that Janet’s hundreds of reboots have “mutated” her beyond all other Janets (and her own design), Carden has to let self-awareness seep into her affect only so far, and no further. And she is, unsurprisingly, great at it, her objection to Michael’s Jason theory (“No! That’s impossible.”) carrying just the right level of knee-jerk desperation to suggest both personal and operational denial. Plus, Janet’s just becoming more delightfully weird, her enthusiastic tics (like her “Kill me” chant to get Michael psyched for the task tonight) edging out of a robot’s idea of human motivational manipulation and more into the realm of genuine eccentricity. After Michael, his logical gambits failing to dissuade Janet from her self-destruct course, blurts out the halting syntax of, “The reason is… friends!” Janet’s rumination on their new intimacy sees Carden modulating Janet’s robotic chumminess into something like confusion, and yearning. In the end, the two settle on a plan. Keep up the charade with the nosy but not-too-bright Vicky, watch what Janet says around Jason, and hope for the best as they all try to find a way out of this mess. Oh, and taking Eleanor’s advice, Janet creates a rebound guy for herself. Michael, shocked, can only sputter out that Janet can’t do that, but there stands Derek. Oh, Derek. The Good Place continues to exhibit impeccable casting instincts, and Jason Mantzoukas joins Jackson, Adam Scott, Tiya Sircar, Steve Berg, Bambadjan Bamba, Seth Morris, Joe Mande, and other recurring actors whose comic alertness fills out the show’s world with unpredictable energy. Mantzoukas is one of the funniest anywhere at playing excitable and slightly unhinged, and his Derek is as enthusiastically clueless as only a just-born artificial boyfriend created on the first try by another artificial life-form struggling with emerging sentience would be. Introducing himself to Michael’s lamp and office plants and walking into his own reflection, Mantzoukas injects “Janet And Michael”’s ending with such an infusion of loony comic electricity that the twist allays some of the suspicions that The Good Place is becoming ordinary. After finding out previously that early Janets used to be operated by click wheel, the “stick a paper clip in a tiny hole” self-destruct method here continues to suggest that the afterlife runs on Apple products. Deactivated Janet marbles can be enjoyed as a snack, which is very high in potassium. D’Arcy Carden is outstanding throughout at maintaining Janet’s beaming impassivity while people are doing weird things to her nose and face. We find out that Janet’s core temperature is somewhere around 99 trillion degrees (Fahrenheit? ), and that, when you shine an otoscope into her ear, it emerges as a prism on the other side. Also, no blood. Janet was the one who helped Michael come up with the perfect Good Place food “that people think they enjoy that’s also sort of a bummer.” Goodbye, flan. Hello, frozen yogurt. Michael and Eleanor, at different times in the episode, refer to the absent Jason as a “ding-dong.” Fair. Jason Mantzoukas exclaiming happily, “What’s going on right now? !” is the biggest laugh in an episode filled with big laughs. Welcome aboard.